VIDEO: 3D printed china set and a bioreactor in our own kitchen. In this VTT video series the impacts of bioeconomy and new innovations are explored through conversations between a scientist and his daughter. In part 1 a meal is served: on 3D printed, bio-based plates. 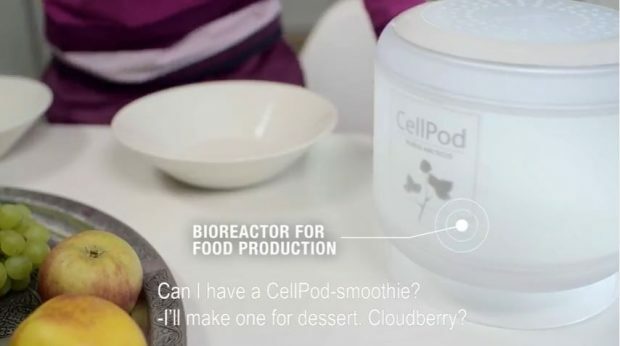 For dessert, a CellPod-smoothie made with cloudberries. VIDEO: What are the packages made of? In part 2 a grocery store is full of bio-based packages. And the packages are smart too: they can tell us how fresh the product is. VIDEO: How to Grow Plants Without Soil at Home? Some of the most interesting plants cannot be cultivated in fields. VTT’s research scientist Lauri Reuter tells us how on earth it is possible to grow those plants – even at home. VIDEO: How to Feed Another One Billion People More with the Current Cereal Chain? VTT’s research team leader Emilia Nordlund explains why the development of technologies for upgrading food industry side streams to main streams is worthwhile. VIDEO: Revolution in the Food Supply Chain. Research Professor Kaisa Poutanen from VTT, the Technical Research Centre of Finland talks about the revolution taking place in the food supply chain – what is changing in the way our food is produced and delivered to the consumer. Food Delivery Ecosystems: An agile ecosystem saves raw materials and generates less waste, as the product is only made to order to meet a consumer need.